Olive usually went on the buses. Suicide bombers come in all colours. On route to Green Nan Common. "...Mind if I sit, I'm mold?" I wonder if she suffers from Vert-igo? It seemed like a good idea until she caught aphids. She was well gnome on the London Underground. She is a aphid follower of fashion. Nancy looks to be on her way to a ripe old age. "We are now approaching Lime Street Station." It's even worse than double denim. Dressed in blue when she went, and just come from Turnham Green. Do you want to see what colour my underwear are? "when I filed for divorce he saw red." Awww I love More-Green Lipman. It's hard to be a ninja when you're fabulous. There's only one outfit for Bernadette on the 17th March. 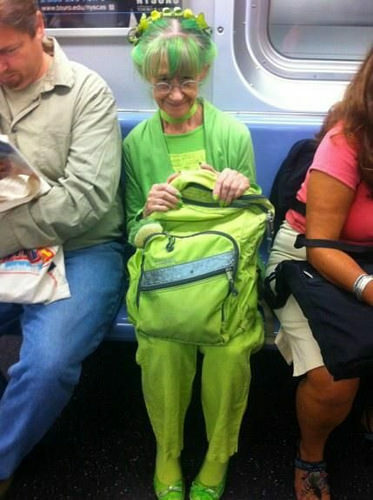 "Yes, Gran, you look exactly like Kermit, okay?" I bet she's a Limey. "You look a million dollars... all green and crinkly"
Oh Sally ! Didn't see you there !